Jackson’s stopped evening opening on 3rd September 2016. I’ve left the review up for posterity. I’ve never quite worked out what the limits of the ER catchment area are, but Jackson’s has to be right on the edge. It’s only thirty minutes out of town but somehow it feels like a longer, more circuitous drive than that, out through Shinfield and past Arborfield before the countryside gets quite beautiful and the houses start to thin out. Then you go along Nine Mile Ride, turn off into California Country Park and suddenly it’s like being in Canada (or at least Center Parcs), all tall trees and wooden signs, Lycra-clad cyclists and healthy-looking types: types, in fact, unlike me. The sun still flecked the leaves on a July evening as I made my way to the restaurant but I could completely see what it would be like during the daytime, full of families enjoying the great outdoors and the aforementioned cyclists taking a pit stop before heading on towards somewhere suitably pastoral. Jackson’s – next to the oddly named California Lake – tries to offer something at all times, so they do breakfast (all day, apparently: worth knowing) and sandwiches, burgers and jacket potatoes for lunch before morphing into a restaurant in the evening. And a Proper Restaurant at that, if the menu is to be believed, full of little touches and hints that make you really want to turn up and order everything. The dining room is a big space full of chunky, solid, simple wooden furniture with white and red tablecloths. I assume the only things that change from day to night are the tablecloths and the mood lighting, little lamps sitting on rough-hewn rustic tables, but I imagine the space must be lovely at any time of day. I caught sight of the wood-burning stove and, for the first time this summer, found myself wishing it was ever so slightly darker and colder. Only two other tables were occupied, which was a tad awkward; they looked delighted that somebody had joined them. I said the menu was full of little touches. 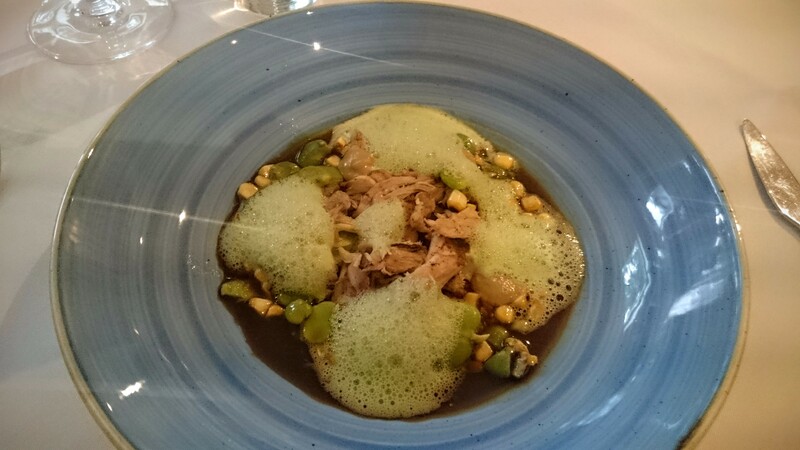 Have a look at how they described our first starter if you don’t believe me: “Nutmeg and Thyme Confit Chicken Thigh, Chicken Broth, Crisp Skin, Wild Mushrooms, Broad Beans, Charred Corn & Spinach Foam”. Sounds good, don’t you think? And generally speaking it was. The thigh meat, soaked in the broth, was like the wonderful bit at the end of a roast dinner when you get to the last shreds of chicken, falling apart, soaked in rich salty gravy. Intensely good. The wild mushrooms were served as little splodges of purée that added creaminess but were otherwise a little lost. The broad beans – very large, very green, beautifully fresh – were top-notch. Only some of the corn was actually charred, but it added a nutty, chewy texture, nonetheless. No crisp skin, either, which is a great shame as they’re always two welcome words on any menu I look at. Last of all, the spinach foam added great colour (thankfully not too reminiscent of frogspawn) but not a lot else. So, lots going on but did it justify all that complexity? No, not really. I could admire the creativity and all those – what’s the word they use on Masterchef? – processes, but I’d have been just as happy with a big ramekin of chicken, broth and broad beans, especially as the dish was too shallow for me to scoop up the remaining broth at the end. 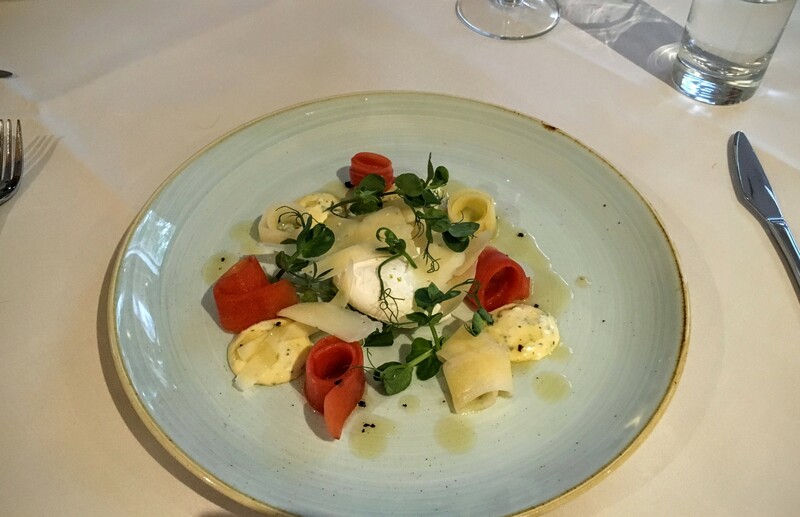 The other starter – “Sweet Pickled Heritage Carrots, Truffle Mayo, Poached Local Hens Egg, Summer Truffle, Parmesan & Honey Dressing” was more successful. A pretty, delicate, deceptively substantial dish it was built around those glorious spirals of sweet, crunchy pickled carrot and a mayo which managed to get those truffle notes just the right side of overpowering (although I do have a very high capacity for truffle). The parmesan shavings added grit and salt and the egg, poached just right, oozed enough golden yolk to bring everything together nicely. There were also pea shoots, which I could have done without (given the kitchen sink approach to the menu I’m surprised these weren’t mentioned) and little blobs of insubstantial dressing, also dotted with tiny pieces of truffle. Pickle, truffle, parmesan, poached egg: these are a few of my favourite things, and I loved this dish. After two thumbs up for the starters I felt hopeful for the main event, and I was right. 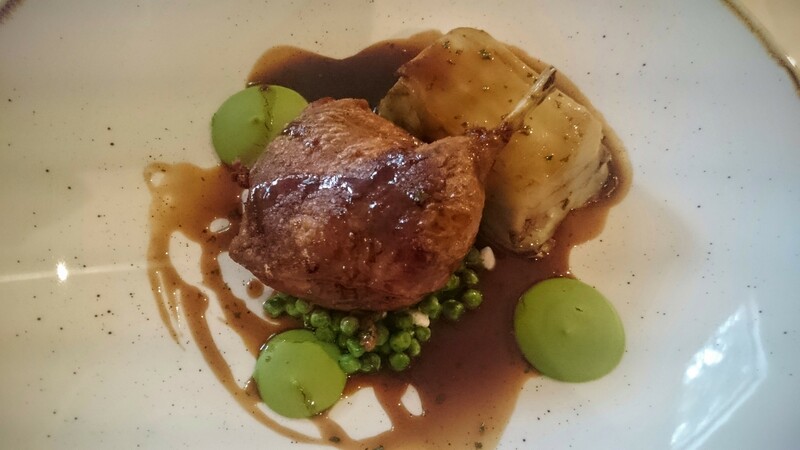 Well, half right: the confit duck leg was lovely. It was salty and rich with the meat falling away from the bone, exactly as it should be. The skin was perfectly crisp (nearly compensating for that chicken skin that went MIA earlier in the meal) with no flabby edges, almost how I think pork scratchings should be but so rarely are. So far, so simple, but underneath the duck was where things got a lot more interesting; a pile of “young” peas (whatever they are, petits pois presumably) was given freshness and tang with fresh mint and crumbled feta. Some of the peas had also been puréed and served in pretty acid-green dollops which were surprisingly rich when smeared over a piece of the duck leg. The ham hock and potato terrine – a brick of potato with a layer of ham hock pressed as a seam through the middle – wasn’t such a hit. The potatoes were too hard and too lukewarm to be enjoyable and I ended up pulling out the ham hock to eat on its own; far from a punishment but probably not what the kitchen intended. Luckily, we’d ordered truffle chips on the side and my goodness, they were cracking: thick-cut, fluffy inside, tossed in parmesan and then sprinkled with what I imagine was truffle oil. But there were also dark speckles of truffle throughout the bowl and the whole thing gave off that distinctive earthy, dirty aroma (oh to be a truffle pig!). Five pounds for these, but worth the money and possibly worth the price of admission alone. If I was being critical they could have done with being a little crispier, but at the end there was a little tangle of truffly molten cheese which I scooped up with my fork and at that point, such minor quibbles faded into the background. If they were the kitchen at its best the other main was the biggest dud of the visit. I wanted to try something more straightforward to test the range of the menu so I went for the chicken breast burger and here’s where things went awry. It was described as coming with parmesan, truffle mayo and double smoked bacon. Well, the bacon may have been smoked twice but it was put on my burger zero times, something I didn’t realise until it was too late to send it back. The chicken itself was lovely, slightly flattened and breaded, almost like a chicken Milanese, but the outside – bit of a theme here – wasn’t crunchy and crispy as it should have been. The Parmesan was a thin layer, almost more like a sauce than a discernible slice of cheese and that was good, although it made things rather soggy. No truffle mayo that I detected either, unless my tastebuds had been numbed to truffle by then. I suppose it’s possible. Nice brioche though, and the usual suspects – tomato, iceberg, right ahead, red onion – were joined by a row of little crunchy cornichons which almost redeemed matters. But really, this burger cost fourteen pounds and it just wasn’t worth that. I do need to single out the triple cooked chips which came with the burger for two reasons. One is that they came in a Jenga stack. Now, some of you may not remember this but Jenga chips were the “food on slates” of their day. Everyone hated them, everyone railed against them and as a result I thought they had become extinct. I was so surprised to see them on a plate in a restaurant like this that I wanted to check the date on my phone to see if some kind of Quantum Leap oddness had gone on. But that aside, they were a sad and flabby bunch. Maybe it was the time taken painstakingly arranging them in a tower, maybe they just weren’t very good to start with, but they weren’t triple cooked. They were somewhere between once and twice cooked, I decided, before eating a couple which I would describe as barely cooked chips. The dessert menu was full of interesting things but only one of us fancied one (that chicken burger had somewhat dampened enthusiasm). The first item on there really intrigued me, and when I asked for advice it was also the one recommended by the serving staff and that, in restaurant terms, is kismet, right there. 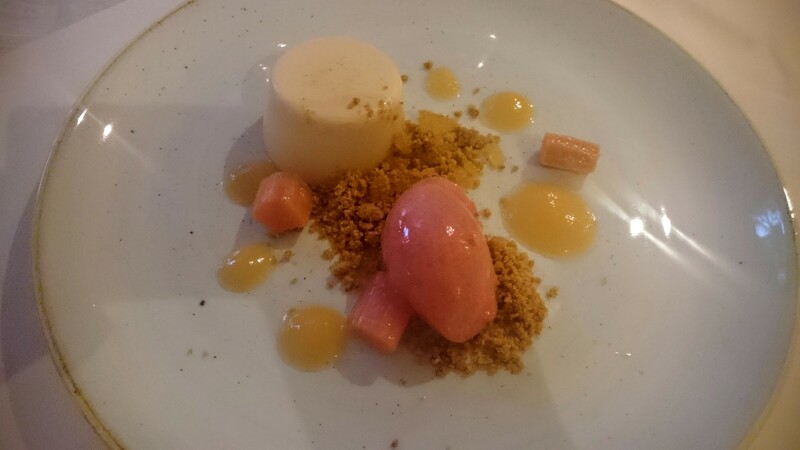 Liquorice panna cotta with rhubarb and stem ginger might have been the dish of the whole meal. Yes, liquorice panna cotta. If you’ve ever tried the basil and balsamic panna cotta at Pepe Sale you’ll know that it’s worth taking a risk sometimes with flavours that don’t obviously go and this was definitely true here, especially after some of the inventive touches in the previous courses. The panna cotta itself was dreamy – super thick, well set and extremely creamy. It had most delicate liquorice flavour to it, almost metallic in the mouth, nearly an aftertaste, the hint of something. I’m lost in a reverie remembering it, and clearly struggling to adequately describe even if you don’t like liquorice – and I’m not a massive fan – I’d still thoroughly recommend it. It came with an embarrassment of riches: dots of ginger and rhubarb purée; sweet, intense pieces of cooked rhubarb, crumbled stem ginger cookie and a scoop of rhubarb ice which somehow managed to be halfway between a sorbet (fresh and bright) and an ice cream (smooth and creamy). I don’t know how the chef came up with the idea to put those flavours together and I’m not sure I care. It doesn’t really matter: I just loved it. Sadly I was driving so I only got to try one glass of wine; the carignan was a nice, rich red (good enough for my companion to have it as their second glass). I’m told that the Riesling was nice, fresh and not as good as the carignan. That was after some grumbling about the chicken burger, so I managed to be on the receiving end of both food envy and wine envy. Oh, and I had a diet Coke because after the glass of wine I wasn’t feeling particularly imaginative. Still, it came in a glass bottle rather than out of a syphon, and somehow that always feels like proper Coke to me. Service was pretty good; the maitre d’ was charming and effusive and the other, younger staff, although not quite so engaging, also did a good job. Everything was nicely timed, too, which could so easily not have been the case on such a quiet weekday night: nothing came too quickly or too slowly, plates were cleared away when they should be and so on. Two starters, two mains and one dessert plus three glasses of wine and a soft drink came to seventy-three pounds, excluding tip. The starters hover around the eight pound mark and most of the mains are under fifteen quid. For food this imaginative, that’s pretty impressive. What makes this gig, for me, is when I discover a gem. Ideally somewhere in the centre of town, although that gets increasingly difficult, but in any case somewhere wonderful – preferably independent – that you won’t have heard of, offering imaginative, fairly priced food. Jackson’s should be that, and it so nearly is. So why isn’t it? The food, by and large, and the service do indeed say that you’re in a Proper Restaurant. But the elephant in the room is the room itself: the owners have tried to make a step change from day to night but I couldn’t shake the feeling that I was having dinner in a café. I know this shouldn’t matter: I’ve always said that if the food is good none of the rest matters, so I’m troubled that in this case I find it does. Perhaps it’s because of the half hour drive. Perhaps it’s because the room was empty and lacked ambience. Maybe I would have felt differently if it had been full, on a cold winter night with the woodburning stove glowing and the table lamps shining, having dinner with other happy strangers in this little cabin in the woods. So a qualified recommendation from me: if none of that bothers you please go, fill up the restaurant, enjoy some really clever food at simple prices and keep them busy. Personally, I’ll go back when the clocks do. You can still eat Sam’s Wraps at their van on Broad Street or their kiosk in Forbury Gardens, but the shop closed in May 2017. I’ve left the review up for posterity. I’ve wanted to review Sam’s Wraps for some time. It’s a proper Reading success story, starting out as a van on Broad Street before expanding to also take over the café in Forbury Gardens. Then, this year, came the logical next step: they took over premises in the town centre on Cross Street, the one that isn’t Queen Victoria Street but runs parallel to it, a funny street full of barbers and salons (and A Stitch In Time, the alterations place which has a special place in my heart). I would have reviewed Sam’s Wraps sooner but every time I’ve tried has been a Sunday and, despite the claims of the sign on the door, it’s never been open when I’ve strolled up to it. Even approaching it on a Saturday lunchtime I was half expecting it to be shut, and delighted when it wasn’t. It’s a basic but tasteful place – a few tables in the front section and then another room out back, nicely lit through a skylight, with attractive, functional furniture. You order at the counter looking up at the menu, then take your wrap through and get stuck in. And the menu is limited in a way which is also appealing. The clue’s in the name, but there is a range of hot wraps (jerk chicken, piri piri chicken, curry chicken) and cold wraps (the main ones I remember were prawn and something called “vegatarian”, spelling which mightn’t fill you with confidence). I had the jerk chicken, my companion wanted to try the prawn but they had sold out so she went for piri piri instead. The experience is familiar to anyone who’s ever been to Mission Burrito – the staff toast a 12 inch flour tortilla in front of you and ask you if you’d like it spicy. If you say yes, they take less than a teaspoon of innocuous looking chilli relish and smear it a molecule thick across the tortilla (more on that later). Either way they then spoon a really generous portion of chicken – slow cooked, in little dice – into the wrap from the chafing dishes behind the counter. 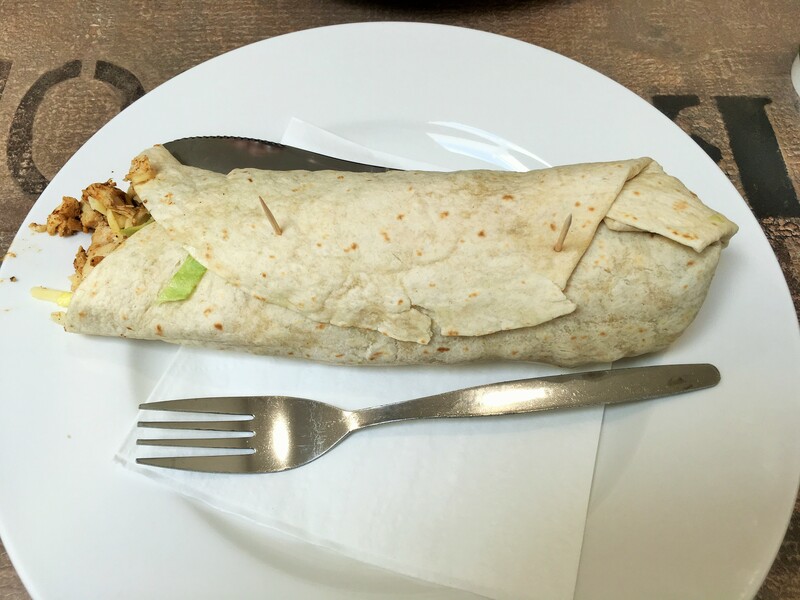 You then decide whether to add cheese before choosing from a plethora of other fillings: cucumber; red onion; finely diced pepper; iceberg lettuce; gherkins; and jalapeno. Finally, you pick a sauce and then they assemble the whole thing, secure it with two carefully placed cocktail sticks, like sandwich acupuncture, pop it on a plate and off you go with it. What this basically means is that the two wraps we had were similar if not the same, and both were bloody gorgeous. They’re huge things, and impressive value at four pounds (cheese costs fifty pence extra), but what also impressed me was just how well they were filled and what good quality everything was. We had the piri piri chicken – smoky and slightly hot but not mouth-stingingly so – with cheese, beautiful crunchy fresh peppers, strips of cucumber and sweet chilli sauce and it was a delight from beginning to end. The jerk chicken, by contrast, was with Reggae Reggae Sauce, cheese, lettuce and sweet, cold slices of gherkin and was equally good, although because I had this wrap with a smidge of the chilli relish by the end my tastebuds had been thoroughly nuked and my tongue felt like it had been put in a vice, doused in petrol and set alight. If you like heat, have the chilli relish and enjoy yourself, but if you’re in two minds give it a wide berth. Either way I’m not sure the cheese really adds a lot, especially for fifty pence. Oh, and I was dubious about how effective the cocktail sticks would be but the guys at Sam’s Wraps really do know what they’re doing, because they make it very easy to eat with your hands; also, once you get past a certain point in the wrap you can pull one out and feel ever so slightly like you’re playing Kerplunk. I’m afraid that’s all there is to it, this week. I went to Sam’s Wraps, I tried two different wraps and they were absolutely splendid. I could tell you that I had a cup of Earl Grey which was nothing special. I could tell you that service, if a bit dour, was very efficient and well done; not much to do in a sandwich shop except explain and execute, but that was all present and correct. They even re-did the jerk chicken wrap after accidentally adding chilli sauce instead of Reggae Reggae (thank heavens they did, or it would have been hotter than the sun). I suppose I should tell you that the whole thing cost ten pounds thirty for two wraps and a solitary cup of tea, and that they really should sell bottles of milk if they’re going to serve anything with that chilli relish. But that’s it. Sam’s Wraps is not flashy, it’s not showy but it’s very good at what it does and without tapdancing it’s really rather terrific. If only the same could be said of this review. Oh, and as I left I saw a big sign in the window saying “NOW OPEN SUNDAYS”. Bloody typical. It’s not good, on a Wednesday night, to be the only people eating in a restaurant. Immediately alarm bells start to ring: what does everyone else know that I don’t? Is it bad? Is it safe? What am I doing here? Another good question is what year is it?, because although it’s 2016 everywhere else, in Smokin’ Billy’s it seems to still be 1995: there are nachos and loaded potato skins on the menu and a five foot high fibreglass model of Marilyn Monroe near the bar. All very glory days of TGI Fridays, I guess, and so 90s that I expected to leave the place to see Café Iguana in full swing opposite (how I miss the Rome toasted sandwich with garlic and herb potato wedges), to be able to head to Edwards’ or Bar Oz down by the train station for a final drink. The Marilyn theme wasn’t confined to the statue: there were pictures and quotes from Marilyn everywhere (along with random electric guitars and Norman Rockwell prints on the walls) a testament to Smokin’ Billy’s previous incarnation as Monroe’s. According to the nice chap at the bar it was renamed nearly two years ago but otherwise very little has actually changed – same menu, same décor, same chef. Looking at the menu I could quite believe that it was two years old, judging by how sticky it was. Popping to the loos down the badly lit corridor at the back (no signs on the toilet doors, incidentally, which could be tricky after a couple of drinks) it was apparent that the stickiness extended to the floor – so much so, in fact, that I could see my footprints on the laminate. That said, the kitchen looked clean and the Score on the Door was five out of five (I won’t lie: I was crossing my fingers when I came back to order, hoping the rating wasn’t also two years old). It would have been wrong not to order the potato skins – many things from the Nineties have been rightly consigned to the rubbish bin of history (Noel’s House Party, Mad Dog 20/20, every record ever released by Jimmy Nail) but I think the time is right for loaded potato skins to make a comeback. 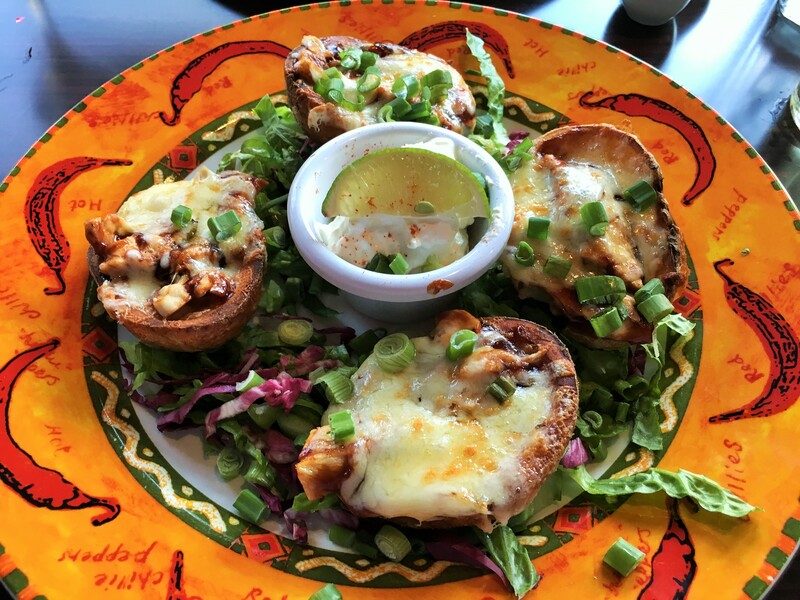 Sadly, Smokin’ Billy’s is not the right stage for it: we ordered them topped with barbecue chicken and expected a thin crispy potato skin, hollowed out and filled with good stuff. The topping, such as it was, was reasonably good (hard not to enjoy barbecue chicken and cheese), but when the thing your loaded potato skin is loaded with is, well, potato you’ve accidentally ordered jacket potato as a starter. And nobody wants that, surely? Similarly the garlic mushroom and cheese quesadilla was more Ocean Colour Scene than Oasis. A Mexican toasted sandwich is a great idea in theory but this didn’t work in practice because the mushrooms were just a bit odd: leathery with a weirdly metallic aftertaste. I’m not sure how recently they’d been sautéed or whether that was the problem but something about them really wasn’t right. Hard to detect any other flavour in the quesadilla either, with the mushrooms singing so loudly and so very out of tune. Each starter, served on a massive plate which itself looked deeply 90s, came with a ramekin of sour cream topped with a slice of lime and sprinkled with paprika. Somehow the whole thing felt more Tex-Meh. Another warning bell followed: the waiter cleared our plates away and offered to bring out our mains pretty much immediately. We managed to agree a five minute wait but I couldn’t help worrying and wondering that all that meant was that our mains were sitting on the pass gradually getting less appealing. After all, how could they be ready to come out straight away if they weren’t already ready? As it was, five minutes wasn’t enough to make me feel anywhere near prepared to eat more food: those jacket potatoes in disguise sat heavy on the stomach. By this point my expectations were pretty close to the (sticky, laminate) floor, so I’m happy to report that the main courses were – if not exactly amazing – far better than I had feared. Pulled pork was pretty decent: served on the bottom half of a burger bun (a bit random, but never mind) the pork was properly shredded but with enough texture to see what it had been, and just about on the right side of moist and soggy, smoky and sickly-sweet. Only just, but I was expecting far worse. It came with coleslaw (served in a lettuce leaf for no reason I can think of), sweet potato fries, mini sweetcorn cobs and onion rings. 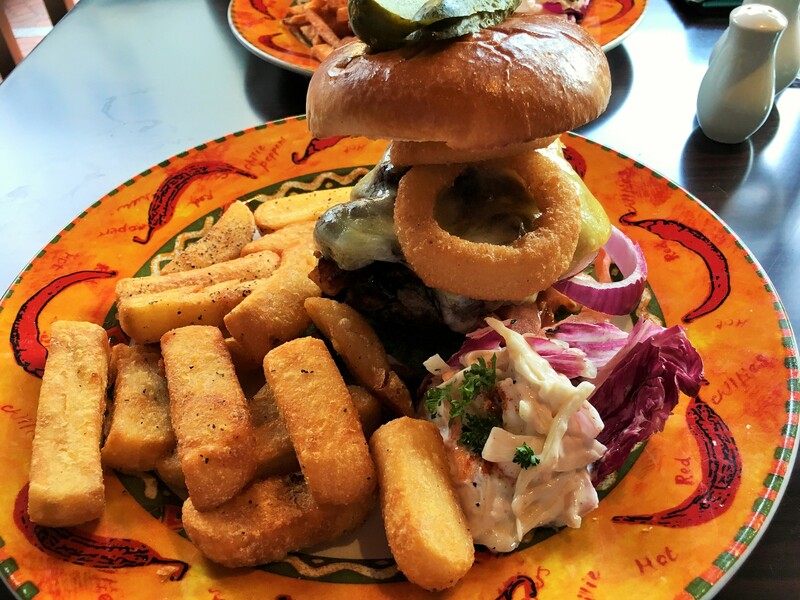 Most of it wasn’t half bad – the sweet potato fries, lovely and crispy, stood out and the onion rings were surprisingly good given that their uniform shape made me suspect they’d come out of a freezer. The corn on the cob though was actively awful: watery, chewy and – if I’m being really honest – strangely fishy-tasting. Not sure how you get that sort of flavour into a corn on the cob, by accident or design, but either way you really need to stop. I’d be surprised if it had been either fresh or freshly cooked. 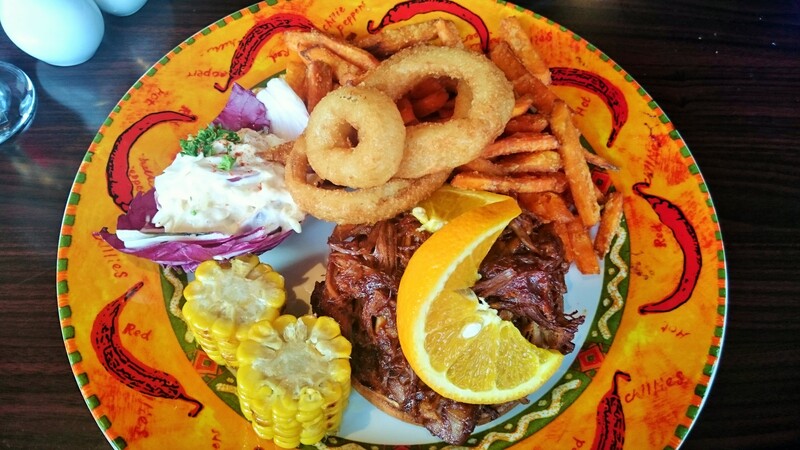 The orange slice on top of the pulled pork, however, was fresh. An baffling choice of garnish, I know, but at least it was easy to discard. Another surprise: the burger wasn’t bad either. I am no burger purist and I’m sure if you were you could find plenty wrong with this one – it was served medium-well according to the menu but I thought it was more cooked through than that. But it was pretty pleasant, with loads of cheese (cheddar, I think, rather than a yellow American slice), some decent bacon, more of the onion rings and a barbecue sauce which, as with the pulled pork and the barbecue chicken in the starter, was nearly too sweet and synthetic but just about on the right side of the line. The bun was allegedly a brioche and managed the feat of looking like one without tasting like anything of the kind, but I didn’t mind it. 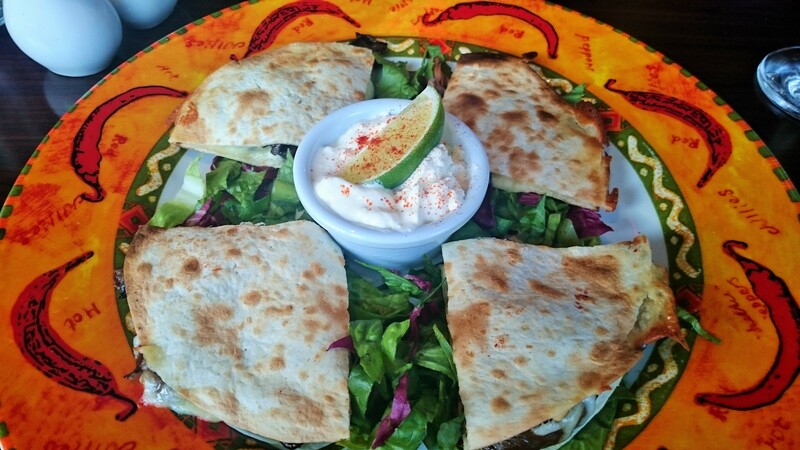 Only those diabolical mushrooms from the quesadilla, making an unwelcome return appearance, wrecked proceedings. But also, I really liked the chips, against my better judgment. Again, their regular shape suggested they’d been chipped in a factory, stuck in a bag and bunged in the freezer but they’d been beautifully fried – crunchy-fluffy and perfect for dipping in some barbecue sauce. Was what I experienced enjoyment or relief? Tell the truth, I’m still not sure. Service, from an idiosyncratically coiffed young man wearing what looked like a cravat, was friendly, chatty and personable. But we were the only customers so some of the lapses were hard to understand: it took a while to order, our mains were seemingly ready the moment our starters were finished yet after we finished our mains our mostly empty plates were in front of us for what felt like an eternity. I think he was chatting to his friend at the bar – which is lovely and all, but his friend wasn’t ordering food or paying a bill (an activity which also took longer than it should have done). And yet I quite liked the charming amateurism: as with everything else, I wanted to like Smokin’ Billy’s a little more than I actually could. There was no drinks list (when I asked the waiter he said “but I can list all the drinks for you”, which kind of sums the place up) and when I got to the bar the selection of soft drinks was woeful (two flavours of J20, cans of red bull and fizzy drinks from the siphon). So I had tap water, which came in a jug with ice without having to be asked – although no water glasses, so I had to have it in a wine glass: yet more randomness. My companion had a pear cider, from a bottle (he didn’t trust the pumps). Both of us would probably have been a lot happier with a bottle of Hooch. Those were the days. The total bill came to forty pounds. If I had gone to Smokin’ Billy’s in 1995 I would have thought it was amazing. The world was a more innocent place in the 90s and we were all so much more easily pleased. Ben’s Thai, Utopia, RG1, actual cinemas in town that weren’t grubby multiplexes, Orient Express down by the Antiques Centre, Trader’s Arcade… the list goes on and on. But in 2016 Reading is a more complex and discerning place, and although I was rooting for Smokin’ Billy’s I couldn’t help feeling that places elsewhere do these things a lot better. Bluegrass across the way has pulled pork sewn up. The Oakford does a better burger. Literally everywhere does better drinks. So if a friend or a colleague dragged me back to Smokin’ Billy’s although I might complain, I’d probably enjoy it while I was there, and tell myself I was being post-modern. But really, it made me glad to live in the now – still missing the 3Bs and Café Iguana, mind you, but delighted with how far Reading has come. I’ve never reviewed the French Horn in Sonning, for one specific reason. Not the prices, although when starters hover around the twenty pound mark and main courses edge closer to thirty it does get harder and harder to say “hang the expense”, convincingly at least. It’s not the faffiness of the menu, although the French Horn’s Habit of Capitalising Pretty Much Every Word does lend Proceedings a Weirdly Dickensian Feel. It’s not even the fact that the menu seems to have an asparagus with hollandaise sauce on it all year round at twenty quid (is it flying first class from Peru?). No, the reason I haven’t gone to the French Horn is that I’m reliably informed it has a dress code, and I just don’t do dress codes. It feels like a throwback, and something about getting into my glad rags just really rankles. I mean, I’m the customer aren’t I? And it’s not like I’d turn up in a crop top or a string vest, hot pants or swimming shorts; I’ve eaten at lots of lovely restaurants just the right side of well turned out and never been turned away, but when somewhere pompously announces they have a Dress Code (those Dickensian capital letters again)? Count me out. What that means is that Nirvana Spa is probably the only place I will ever review which does have a dress code. And when I say dress code, I mean that you eat your lunch or dinner in a lovely white fluffy robe, your towel nonchalantly draped over the back of your chair and – in my case – your trashy paperback perched on the table. And if you go on a warm day, like I did, you get to do all of this outside, beaming at everybody else, similarly attired. This must be a bit like how it feels to be in a cult, or live in California (or both), I’ve always thought. Sometimes I review restaurants and I’ve had a bad day first. I love writing reviews, but it’s a bit like a job – admittedly a job I adore – and there are times when you go and your heart isn’t one hundred per cent in it. Things are crap at the office, or the car failed its MOT, or you’re out of sorts with a friend, or Britain has voted to leave the EU and you still have to go out, eat with an open mind, take photos and write hundreds of words about what it was like. Hopefully you can’t tell in the words or the rating, if I’ve done it properly. Nirvana is the other way round, if anything – it’s hard not to be happy when your most difficult decisions that afternoon are whether to read Hello! or OK!, whether to have the honeycomb tiffin or the salted caramel ice cream in the Roman Room, whether to go to the hydrotherapy pool or snooze on the heated terra cotta loungers. How can you have a bad meal under those circumstances? On the other hand, I went on a long-booked visit the Sunday after the referendum result, when there was a weird atmosphere across the country. That weekend was like waking up hungover with The Fear, not entirely sure what you’d said or done or to whom. To complete the irony, Nirvana’s owner had sent a controversial mail to members only that week “offering them the opportunity to read” an article he’d written about how Brexit was a very good thing (I half expected to arrive to find bunting everywhere). So, a happy place at a sad time: what would lunch be like? The menu at Nirvana has two options – either all you can eat from the salad bar (which also features a number of hot options) for fourteen quid or the a la carte menu which has starters, sandwiches, salads and main courses. The salad bar is included if you visit as a day guest rather than a member and really, I ought to have eaten from it to give you a representative view. But I’m afraid I was in need of cheering up so I didn’t, although I can tell you from past experience that it’s not half bad (and especially impressive for vegetarians and vegans where it gives a range of choice you’d struggle to match elsewhere). Instead I stuck to the menu, deciding to kick things off with a selection of artisan (everyone’s favourite ubiquitous, meaningless word) breads for two. I was denied the opportunity of doing this when they turned up at exactly the same time as the starters, but none the less they weren’t half bad, especially at less than two pounds. All warm, some slightly toasted, a good array with the dark malted one, studded with seeds, my particular favourite. Butter was at room temperature (which always helps) and it was nice to have olive oil and balsamic although, as so often, nowhere near enough. The starters were less impressive. We’d both gone for salads and I wonder whether they had decided to prioritise virtue over taste. Smoked chicken salad was presented in a way almost deliberately calculated to underwhelm – a fan of smoked chicken on one side of the plate, your salad on the other. Not mixed at all, and the salad also appeared to be barely dressed at best. 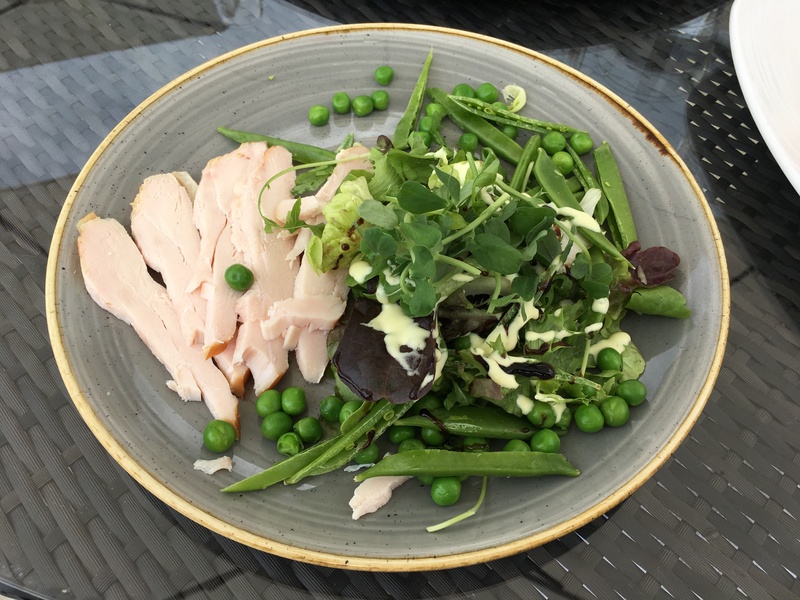 What’s a real shame about this is that it had potential to be a lovely starter if done better – the salad was full of firm peas and crunchy beans and would have been beautiful with a bit more dressing and the smoked chicken, although a tad wan and floppy, did set it all off nicely. I seem to recall that the menu at Nirvana specifically says that you can ask for your salad dressing to be left off completely; it’s a pity it doesn’t also give you the option to ask for it be glugged on with abandon. Similarly, the baked smoked salmon salad was an exercise in restraint. 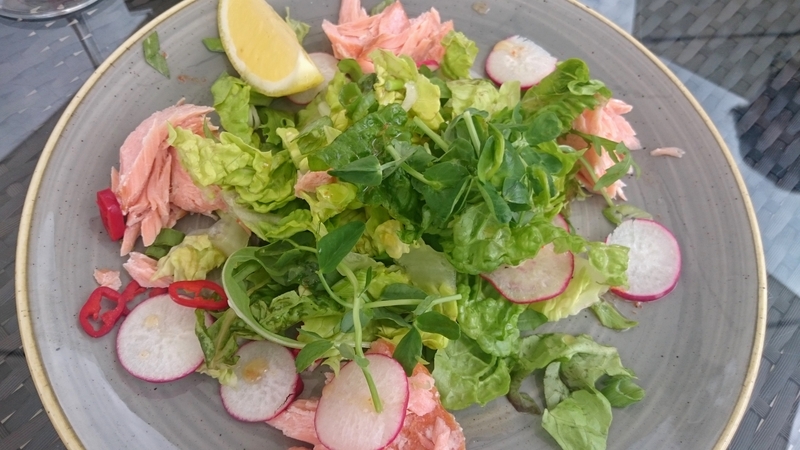 A handful of salad leaves lightly dressed, topped with a thinly sliced radish (singular, I’m guessing) with a few chunks of salmon dotted round the edge. I was expecting a tangible piece of salmon rather than these chilly fragments and considering it was the most expensive starter on the menu (nine quid, since you ask) it felt miserly. It came with a wedge of lemon, just in case you weren’t feeling bitter enough, and a few de-seeded slices of chilli, mixed in as an afterthought. If I’d made this myself with bits from M&S it would have cost half as much and been twice as big. A shame, because what there was was nice, refreshing and light. I was just glad we ordered the bread. After all that the main course was a beautiful, delicious surprise. 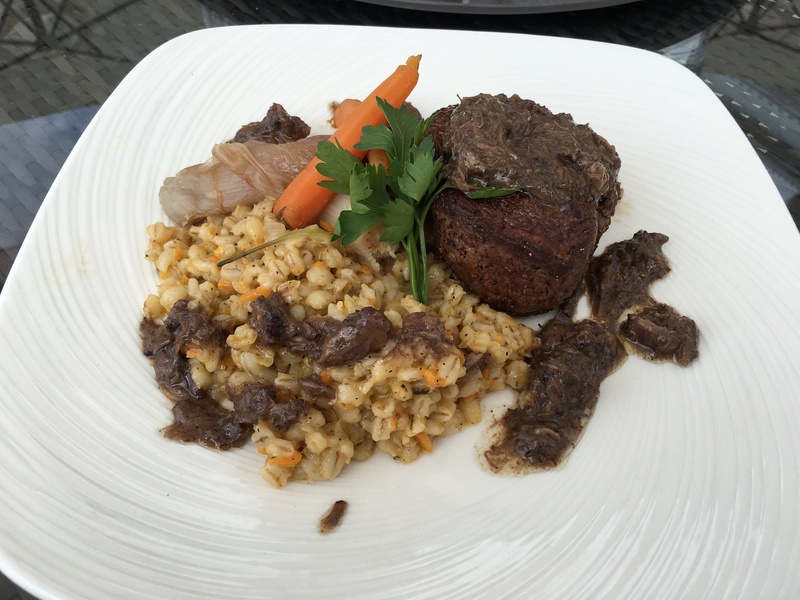 Fillet steak came with a delicious, nutty pearl barley risotto which I adored. I’ve had pearl barley risotto quite a lot in Prague for some reason but it doesn’t seem to crop up on menus here much, a shame because it has much more about it than conventional risotto often does. There was also a solitary carrot – fair enough, I suppose – and two beautifully sweet, shallots which had been cooked into softness. The fillet itself was rare, exactly as requested (I went back to CAU recently and they, a specialist steak restaurant, still seem unable to get this right: Nirvana 1, CAU 0) and although I would have liked it to have a little more flavour, the texture was terrific. Finally, drawing everything together, what the menu described as “oxtail sauce”, rich strands of oxtail strewn on top of the fillet and all over the pearl barley risotto. Sixteen pounds fifty for that lot, and one of the most interesting ways I’ve had fillet steak for a very long time; if this dish had been on the menu at a restaurant near me I’d already be trying to contrive an excuse to go back. 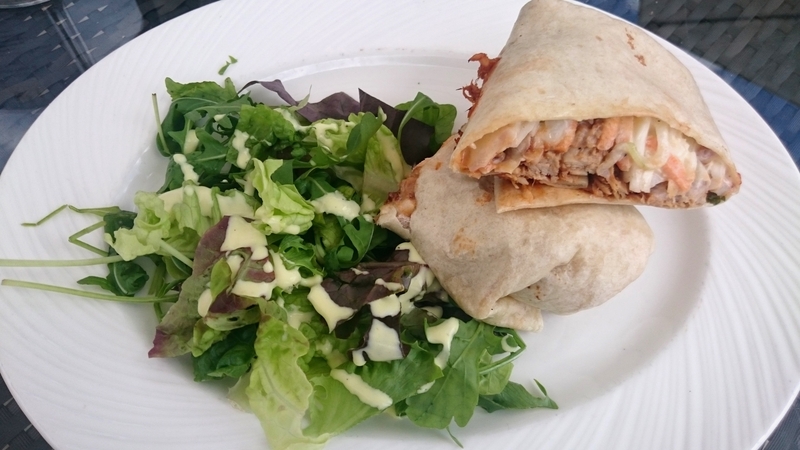 I also wanted to check out the lighter options on the menu, so we ordered a pulled pork wrap. This was just lovely: the thin flour tortilla was rammed full of really good pulled pork (smoky and sweet without being sugary as it so often is) with fresh, crisp, contrasting coleslaw. I liked the fact that it was served warm, too – so different from a cold claggy sandwich. It cost as much as the salmon starter, but felt like considerably better value. It came with a small leafy salad I didn’t much care for with a squiggle of creamy dressing, but perhaps I was just saladed out by that point, if such a verb exists. It might not have looked much in comparison to the fillet steak, but I thoroughly enjoyed it all the same. Nirvana isn’t the place to order a dessert; you’re there all day after all, and saving some room for an afternoon snack is one of the only ways to break up the delirious monotony of being a modern-day lotus eater. So we finished our drinks (a decent glass of New Zealand sauvignon blanc for me and a rose cava for my companion), charged the meal to a membership card and ambled off in the direction of an outdoor jacuzzi. 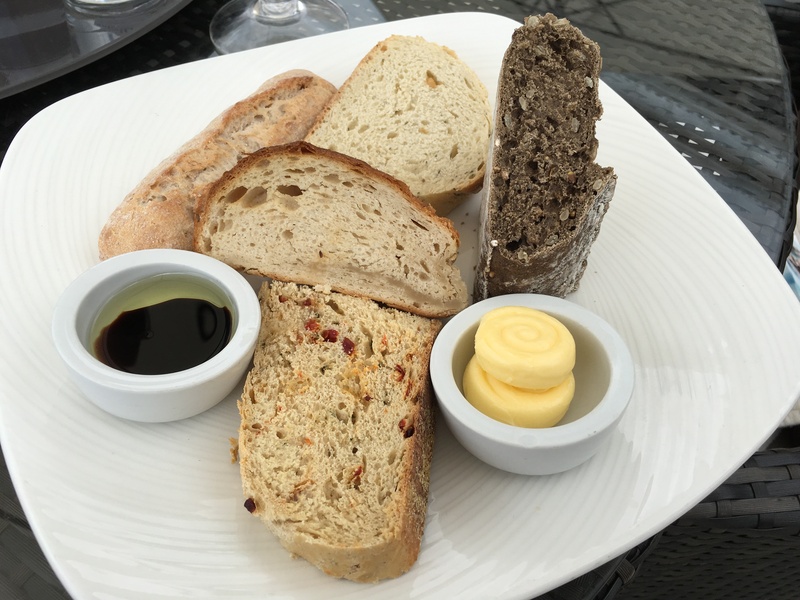 Two courses, that bread selection and a couple of drinks came to a smidge under fifty-five pounds. That doesn’t include service at Nirvana, but all the service there is smiley and friendly, on the informal side but none the worse for that. If they were elated or devastated about Brexit, they certainly didn’t give it away. As I sat in the outdoor jacuzzi, wishing they let you drink bubbly in there, I did briefly wonder about whether you could separate Nirvana’s food from the overall experience of being at a spa for the day. I’m not sure. If you picked the restaurant up and plonked it somewhere else, aside from being perturbed that all your fellow diners were in robes, I think you would like but not love the food. Not just that, but some of the pricing seems strangely generous (that fillet steak main), some arbitrarily expensive (the smoked salmon starter). As so often, I wonder about the wisdom of giving a rating; I love being at Nirvana, I love eating there and yet eating there isn’t quite the point. But then I decided I’d thought about it quite long enough – the world outside appeared to be either taking back control or falling to pieces, depending on who you believe – and before long I would have to leave my hermetically sealed bubble and go back to it. I was glad my phone, with access to constant news, was stowed away in a locker. Later on I did go to the hydrotherapy pool, by the way. Some of the massage jets weren’t working, and many of the handles you use to cling to the side were broken off. It’s been that way since the start of the year: it’s a shame the owner feels like he has better things to do than fix it.